Yang Jiayu raced to gold in a thrilling finish to the 20km walk at the worlds but Lyu Xiuzhi learned she had been dramatically disqualified when meters away from taking the bronze. Yang Jiayu of China crosses the finish line to win the gold medal in the women's 20-kilometer walk event at the !AAF world championships on The Mall in central London on August 13, 2017. 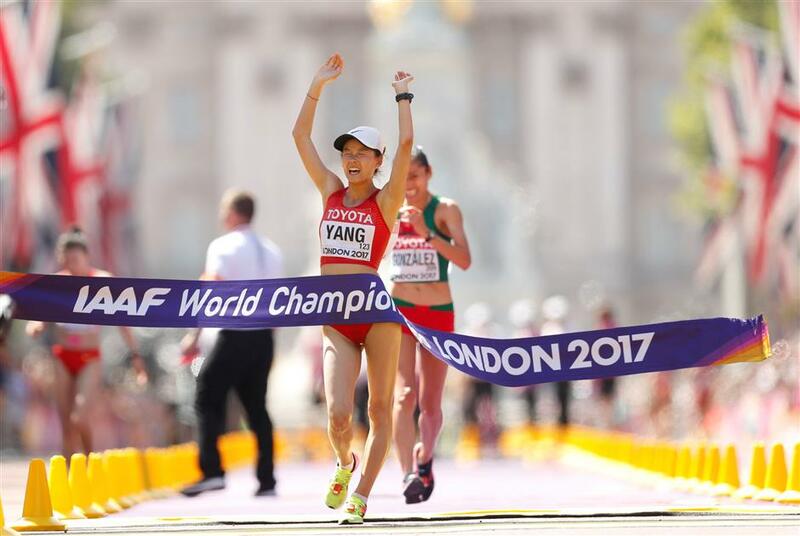 Yang Jiayu raced to gold in a thrilling finish to the 20-kilometer walk at the world championships in London on Sunday but her compatriot Lyu Xiuzhi learned she had been dramatically disqualified when meters away from winning the bronze medal. Yang upped the pace over the last 100 meters on the Mall to power away from Mexico's Maria Guadalupe Gonzalez and finish a mere one second clear in 1 hours 26 minutes 18 seconds, a superb triumph for the 21-year-old in her maiden senior championship. Yet Lyu, perhaps favorite for the title, did not realize she had already received a third red card for a late infringement — meaning automatic disqualification — as she was still racing home just behind Gonzalez. As she was less than 20 meters from the line believing the bronze medal was in her grasp, a senior official stepped out in front of her to confirm her disqualification. It meant that Antonella Palmisano, who had been broken by the leading trio just as they started the last of the 10 two-kilometer loops between Admiralty Arch and Buckingham Palace on The Mall came home for the bronze in 1:26.36, Italy's first medal of the championships. "I feel really excited," said Yang. "I started race walking at the age of 14. Now I hope to be the future of race walking in China." Yet she had time to spare a thought for her disqualified teammate. "I feel sorry for Lyu. Maybe she'll get to win a competition soon," Yang said. The result was also tough on former boxer Gonzalez, who had also missed out on gold at last year's Rio Olympics by just two seconds. Her consolation was in becoming only the second Mexican woman to medal at the world championships after Ana Guevara, the former 400 meters champion. "I did all I could but the Chinese athlete was better in the final part. It was very close but we made it a fight to the line." She, too, spared a thought for Lyu. "She is an excellent race walker who continues to work hard. It is a difficult moment for her but she'll be ready and stronger in the next few years." Palmisano, who was fourth at last year's Olympics, was delighted to this time make the podium in unexpected fashion. "I was only concentrated on myself. I feel sorry for Lyu but I wanted that medal and now I have it," she said. Earlier Ines Henriques smashed her own world record by more than 2 minutes to win the inaugural women’s 50km race walk at the world championships. The 37-year-old crossed the finishing line at The Mall in 4:05.56, obliterating her previous best of 4:08.26 which she set in January after the IAAF ratified conditions for a women’s 50km record. Henriques dominated the race to win her first major global title, and the first race walking title to go to a Portuguese woman. Draped in the flag of her country, she was embraced at the finishing line by a member of her team and cheered generously by the crowds lined up all the way down from Buckingham Palace. "It is great that the 50km is at the world championships despite the fact that it is a really hard event," Henriques told reporters. 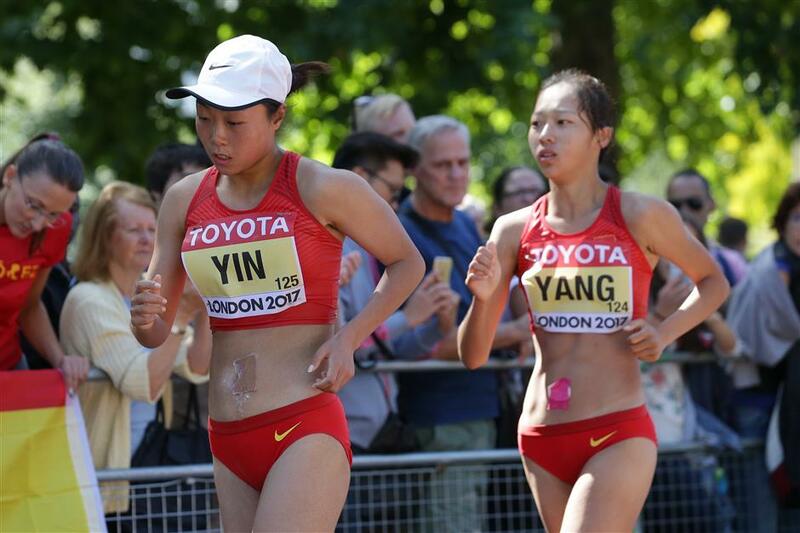 China's Yin Hang and Yang Shuqing compete en route to taking the silver and bronze medal, respectively, in the women's 50km race walk at the IAAF world championships on The Mall in central London on August 13, 2017. "The last 5kms were really tough. My goal was to go under 4 hours and 6 minutes, so I am really happy with this time. "It felt like at home in London with so many Portuguese fans supporting me. I hope that in future we will see more women competing at this distance." Athletes from China completed the podium. Yin Hang claimed silver with an Asian record of 4:08.58, while 20-year-old Yang Shuqing finished third with a personal best of 4:20.49. The conditions were near-perfect for the athletes, who were competing at the same time as the men, with bright sunshine, clear skies and a cool breeze. The IAAF introduced the women’s 50km to the program in July in order to ensure gender equality and there were only 7 competitors. Yohann Diniz had earlier produced an astonishing solo tour de force to become the oldest man ever to become a world athletics champion at the age of 39 as he won the 50km walk title. The French world record holder, one of the great figures of race walking, produced the second fastest walk in history, 3:33.12 — a time only he has bettered — with arguably the performance of the entire world championships. Diniz was so dominant en route to his long-awaited first global title that he lapped nearly all the 43-strong field over the 2km looped circuit on The Mall, finishing less than a minute adrift of his three-year-old world record of 3:32:33. He was even able to take a swift comfort break when leading in the first 15 minutes before rejoining the race and destroying his opponents over the 25 laps between Admiralty Arch and Buckingham Palace. A great showman, father of two Diniz was even able to smile and wave to the crowds lining the course well before the finish. He blew kisses towards Buckingham Palace on the last circuit, turning it into a glorified lap of honor, and finished by approaching the line while hoisting aloft a French tricolor he had grabbed from the crowd to celebrate his new championship record. His 8-minute gap over his two distant Japanese pursuers, silver medalist Hirooki Arai (3:41.17) and bronze winner Kai Kobayashi (3:41.19), was by far the biggest ever recorded in the championships. Diniz became the oldest male world champion in any event, surpassing another walker, 37-year-old Veniamin Soldatenko. The Soviet athlete won a specially-staged 50km event in Malmo in 1976, seven years before Helsinki staged the first global championships. Belarussian Ellina Zvereva holds the overall record of being the oldest world champion, having won the women's discus in 2001 at the age of 40.